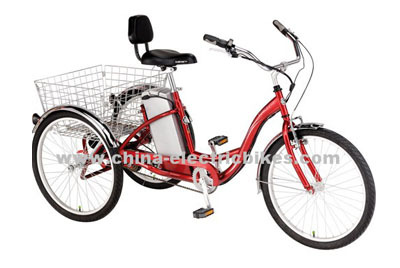 The battery bike comes with large stainless steel basket to carry everything you need. The the electric trike bike is designed for carrying the rider and an extra 45kg in the back.the electric trike bikes have a wide comfortable seat with back rest,and Shimano Nexus Inter 7 Speeds,Super White LED front and twin red LED rear, powered by main battery. 1 . Prevent exposure to extreme temperatures cause electric trike bikes battery internal pressure of the battery increases the pressure limiting valve forced open automatically increase water loss is a direct consequence of the battery, and the battery will inevitably lead to excessive cell activity decreased water loss , accelerates plate to soften , charging shell fever, from the drum shell , deformation and other fatal injuries. 2 Avoid charging plug the charger output plug fever loose contact surface oxidation phenomena can cause charging plug fever , fever too long can cause a short circuit charging plug , direct damage to the charger , lead to unnecessary losses. So found out that the case should be promptly removed oxide or replace connectors. 3 in the course of regular inspections , if the electric trike bikes to continue the mileage suddenly dropped a dozen kilometers in a short time , it is likely that the battery pack at least one battery has broken grid, plate soften electrode active material shedding short circuit. At this point , should go to a professional agency to check battery repair , repair, or with a group . This can extend the life of the battery pack relative to maximize savings.